Q. How can I create my own custom bullet points? A. In Word and PowerPoint, you can create bullet points that look like your company’s logo or follow a holiday theme. Here’s how. 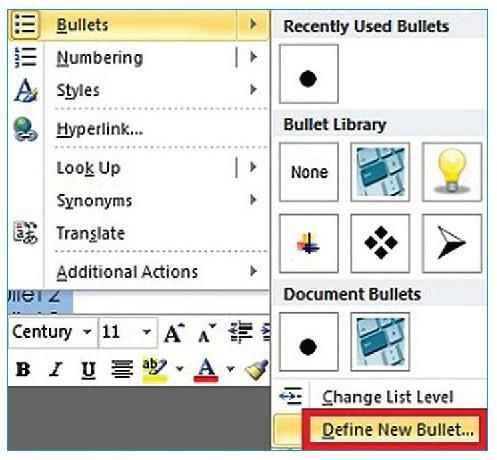 Apply bullet point formatting to your list in Word or PowerPoint. Right-click your list and choose Bullets, then Define New Bullets at the bottom of the fly out menu. Now, you can choose one of the pictures shown or choose the import button from the lower right corner of the dialog box and find the picture of your choice. I recommend creating a small picture of your desired image in Paint to make sure the details wouldn’t make a smaller bullet look messy. Then, import that one. Which Office is going to get it done?